Following up on their popular 70mm variant, Freewing has answered the many customer calls to scale up their F-104 Starfighter and give it the full "90mm Super Scale" treatment. Own a bigger piece of aviation history with this sleek and storied interceptor, the "Missile With a Man In It”! 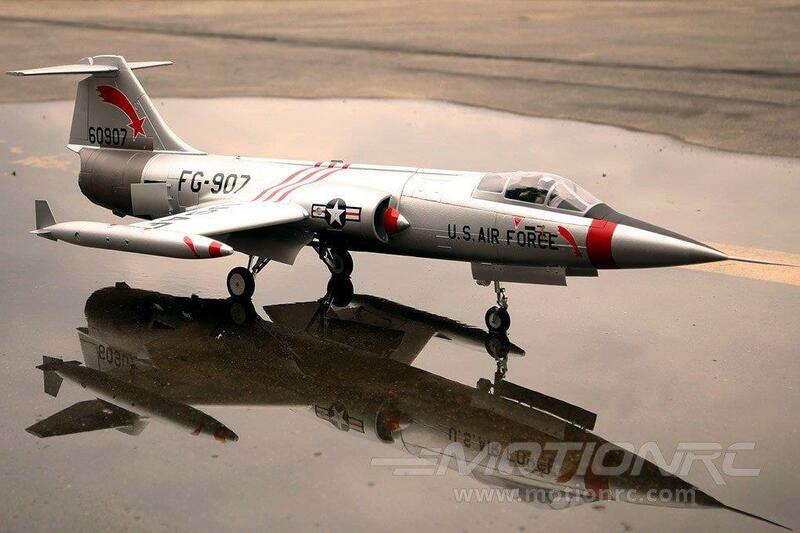 The Freewing 90mm F-104 boasts a host of features that until recently were unimaginable in the foam electric market for this price point such as scale operating landing gear CNC machined from durable 6061 aluminum with steel axles, completely removable flying surfaces, pre-installed gyro flight stabilizer, functional speed brakes, and a pre-installed LED afterburner ring. Additional features include sequenced landing gear doors, an integrated circuit board to simplify wiring, LED formation lights, magnetic nose cone, removable tip tanks, and plastic details including a molded tail cone. The model also introduces an innovative mechanism built into the speed brake that both operates outwards as a speed brake and collapses inward as a spring-loaded cheater vent. A first for MotionRC, we are also offering the Freewing 90mm F-104 Starfighter with a pre-installed Freewing E51 Gyro at zero additional cost from the other Super Scale Series jets from Freewing. The Freewing E51 Gyro stabilizes the flight handling of the aircraft in all three axes, contributing to a more accessible control experience. The Gyro is pre-installed and the gains can be adjusted separately for the Aileron, Elevator, and Rudder channels. A remote On/Off function requires an additional channel on your receiver, and is recommended for initial flights until the Gyro is adjusted to each pilot's personal preference for sensitivity and authority. The Freewing 90mm F-104 Starfighter is quite a surprise at the flying field because it flies much more stable than it appears it can. Onlookers will swear that it cannot fly slowly due to the F-104’s iconic stubby wings, but in fact Freewing has optimized their RC rendition to handle gently at a wide flight envelope while remaining as true to scale appearance as possible.The Freewing F-104 cruises at 50% throttle and we measured an average top speed of 92mph in level flight after a slight dive. With mixed throttle, a 6s 5000 mAh 50c battery gives 3-4 minutes of flight, like other Freewing 90mm jets. With its scale landing gear, iconic profile, and other details, the Freewing 90mm F-104 Starfighter will be standout in your hangar and at your flying field! Tech Note: Please check to make sure that all control horns are securely glued into the foam wing and stabilizer surfaces before flying the aircraft. If any control horn is loose, apply extra glue to ensure the control horn has a strong bond to the foam.